Documentary: The Death of 'Superman Lives' What Happened? If you're a fan of Superhero films or you're a filmmaker interested in the Sci-fi/Superhero genre then this documentary about Tim Burton's doomed movie, staring Nicolas Cage as Superman, from the 1990's, Superman Lives is a fascinating insight into the pre-production of a big budget film. The Death of 'Superman Lives' What Happened?, a documentary by Jon Schnepp, follows the development of the movie from writer/director, Kevin Smith's early, and well documented involvement, right through to the final days of when Warner Brother's pulled the plug and transferred their funding to another movie, Wild, Wild West, that, arguably, should've been canned too. we all said "Hell NO!" to. 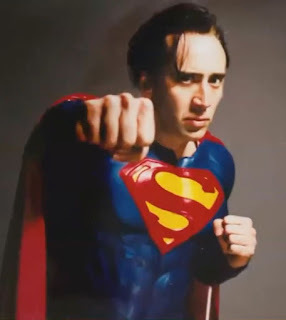 If you're like me, and first heard about Tim Burton's failed Superman movie staring Nicolas Cage when the image on the left was doing the rounds online, you're probably thankful it never happened. 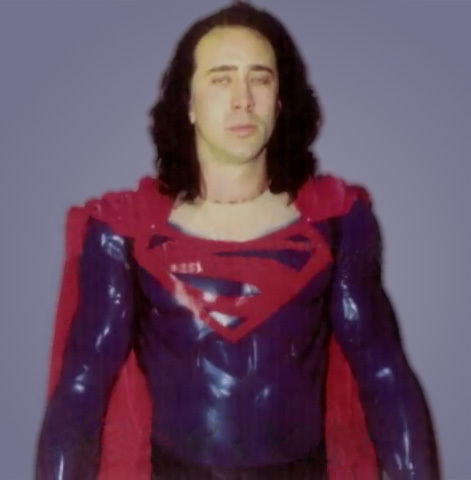 After all, not only is it hard to imagine Nic Cage as Superman, but this image just looks like everyone dodged a bad cos-play bullet. Then, since I discovered that Kevin Smith's story about how he was brought in to write a script for Superman that had to include a giant spider was linked to Tim's film, I've always had a mild fascination for what Superman Lives might have been. Note: If you haven't heard Kevin's story about his dealings with producer, John Peters, on this project, do yourself a favor and watch the video at the link above. It's hard to believe it's true because it's just so comical and hilarious. 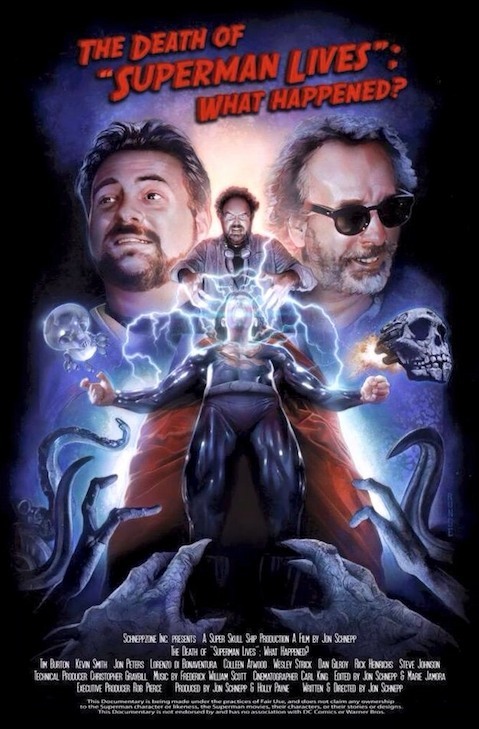 After watching this documentary, which includes interviews with all the key players; Kevin Smith, John Peters, Tim Burton and the various artists and costume designers that worked on the film, your whole opinion on a Nicolas Cage/Tim Burton Superman movie is likely to be flipped. Especially when you consider the Superman reboot that we got with Superman Returns. That I've written about previously in my post, The Trouble with Superman. Even though a Superman movie with a giant spider sounds bat bonkers crazy it's still way more interesting than anything we saw in Superman Returns. design, seen here in a test photo. Not only that but the sheer number of monster designs, a spacecraft shaped like a skull, Brainiac and Doomsday plus a myriad of Superman suit designs, will easily convince you that this thing would've probably been more visually exciting than Man of Steel. Then you see Nicolas Cage actually wearing one of the more classic design of suits that may have made it into the final movie and, sure, he still looks a little unorthodox, but it's not so far off that you can't picture it having the potential to be amazing. It is Nic Cage after all. I found this documentary to be incredibly fascinating. There's plenty of production artwork to give you a sense of what might have been, along with costume fitting footage and discussion with Nic and Tim Burton. Getting to hear Kevin Smith and John Peters talk about their experiences with each other is a rare but special moment too. Not least because John confirms almost every part of Kevin's story, and what he denies you can see that maybe there's still some truth to it. For example Kevin says that John said he didn't want Superman to wear the suit. John denies this but I suspect, given the direction of all the suit design on Superman Lives, John probably meant he didn't want the Christopher Reeve, spandex version of the suit. He wanted a much tougher looking design. It's a real shame this movie didn't get made because I don't think you could make it now, even if everyone who worked on it came back on board. Superhero movies have become something much different to what this may have been, and could even look dated now, since Tim Burton's style is very much linked to all the 90's Batman films, even though he didn't work on the last two. However, as a documentary I'm really glad this story got told. It acknowledges all the hard work that went into the project and elevates it from people thinking Nicolas Cage in a Superman movie was some kind of a joke to something that may just have been pretty darn awesome.